My post for #BodyConfidenceWeek is going to touch on a somewhat different issue than those traditionally related to body image, and it touches on an area that I wasn’t really aware existed until I came out. While traditional issues of body confidence are also very present in gay culture (the pursuit of the perfect chiseled body, and the weight of society’s expectations to conform to that), the psychological and psychical issues that brings up are paralleled in straight culture, and I think that my fellow bloggers have already covered those issues incredibly well in their posts so far. What I want to talk about is a different issue of body confidence / self expression, and one which is far more specific to the gay community – namely, masculinity versus femininity; or more specifically, the rejection of feminine self expression. As regular readers of my posts will know, I came out comparatively late in life – at the tender age of 28. Up until that point I knew very few gay people, and hadn’t been actively involved in gay life to any meaningful extent. One repercussion of this is that I hadn’t been subject to the same societal pressures that gay men who come out younger are exposed to. For those that came out in their late teens / early twenties (as seems to be quite typical for a coming out age range), they’d had a decade of their formative years actively immersed in a culture and a scene that I was only just entering. While that mainly fosters a degree of jealousy on my part, of missed years with a community that I desperately wanted to open myself up to, it did also mean that I missed out on being exposed to some negative factors as well, attitudes that I have no time for and am glad to have avoided during the formative years of my twenties. One of these attitudes is, unfortunately, a begrudging acceptance of homophobic language and behaviour. For people who’ve been the direct target of insults over a sustained period of years, an attitude can set in of ‘just ignore them’; that the insults have been so commonplace that there’s nothing to be gained in rising to them. That’s by no means the only mindset of the gay community and I’d be doing everyone a disservice to suggest that everyone meekly accepts the insults that are served out to them, however I did find it to be a surprisingly commonplace attitude and one that I didn’t expect to really have any degree of prevalence amongst the young gay population. As I’ve mentioned in a previous post I have absolutely zero tolerance for homophobic language and behaviour and always respond whenever I’m aware of it. However I suppose in my case that’s at least as much due to my reaction to having been closeted for such a long time, such that now that I’m finally out, I feel compelled to be as vocal as possible in fighting the attitudes and hate that kept me trapped for so long. Regardless, I was never subject to the pressure of being openly gay but learning to grin and bear it when insulted, nor of not making a scene when provoked, and when I finally became involved in the community I found the existence of that attitude to be quite perplexing. To bring this back on topic, the other major attitude that I was surprised by (even more so than the previous example), is of the rejection of feminine self expression within the gay community. By which I mean, for feminine presenting guys (i.e. the effeminate stereotype that has been traditionally attached to gay men), it can be incredibly difficult for them to find potential romantic partners. In looking at guys’ online dating profiles it is not uncommon to see phrases like, “looking for a nice, genuine, masculine guy”, or, “I’m early 30s, active, masculine”, and so on. I had no idea that so much importance was attached to the notion of guys presenting themselves in a masculine way, however it’s a surprisingly present attitude within the community. Again, as with my previous example it is by no means the prevailing attitude and in no way speaks to the community as a whole, however it does appear to be a surprisingly loud voice and one that can have a significant impact on damaging the image confidence of a whole subsection of the community. This is another attitude that I find incredibly confusing, and of which I am glad to have not been exposed at a younger age. It seems so counter-intuitive to me that any openly gay man would dismiss the idea of dating someone because they are too obviously gay. That because someone fits the effeminate stereotype of a gay man, they’re therefore removed from consideration as a romantic partner. At the root of this I think is the internalized homophobia that most gay men experience to a varying extent. When you grow up surrounded by hatred and bigotry, being told that you are wrong for being the way that you are, even when you come to terms with yourself and come out you still carry that stigma with you, that fear and pain that haunted you through your early closeted life. And part of that can be, as I think is the case here, a desire to create a distance from that stereotype – when you’ve grown up closeted due to the mocking and hatred that was directed at the stereotype, for some people this risks creating a psychological barrier against association with that stereotype. This attempted explanation isn’t in any way to excuse this attitude, as personally I find it absurd and quite offensive. For a community that grows up marginalised, and continues to live marginalised (although thankfully to a progressively lesser extent in the West at least), there should be no further marginalisation of the effeminate community within a community. The ostracism that they can face helps no one, and people’s internalized prejudices shouldn’t encourage them to discount or disparage a key part of our community. Most, if not all, of us carry internalized homophobia, and for each of us it expresses itself in a different way. Hopefully those members of the community whose internalized homophobia is expressed in these attitudes can work through them; as I continue to work though separate issues of my own. I mentioned above that effeminate guys are a key part of our community, and I just want to go into that in a little further detail. For the gay community, visibility is key. Our continued progress towards equal rights hinges on being visible. As Harvey Milk (the first openly gay man elected to public office in the US) argued, the more people that come out the more that are then able to subsequently come out. He argued strongly that all of us should come out, as that was essential to our visibility and to our progress as a civil rights movement. And in the dark years of the early to mid twentieth century, when gays were purged from the military and government and actively discriminated against across society as a whole, our whole visibility was dependent on the effeminate stereotypes. Those who were unable or simply unwilling to hide their self expression, and who took the brunt of the crackdown on homosexuals. To now see them being rejected, to be immediately dismissed from romantic consideration for being ‘too feminine’, or ‘too gay’, does them such a monumental disservice, and one that I cannot fathom. For an issue that gets me quite so worked up, you may be surprised to know that it isn’t one that directly affects me in terms of my own personal expression or body image. Put simply, I’m one of those ‘masculine’ guys that those online daters are looking for. Going to an all boys secondary school you quickly learn to suppress any outward expression of femininity. In that environment any aspect of difference from the norm is quickly pounced upon, and particularly when you’re trying to hide your own latent sexuality, you quickly learn to suppress any feminine expression. As a result of that, the presenting of myself in a ‘masculine’ way is now as ingrained as my Thames Valley accent, a trait forever printed on myself from my childhood. Particularly in Canada, where I’ve been living the past few years, people are often surprised to learn that I’m gay, as they don’t feel that I present myself in a ‘gay way’. Personally I’m slightly resentful of my outward expression. In the words of advice columnist Dan Savage, ‘straight-acting’ can just be code for ‘closeted’, and I find it hard to separate my resentment of the time I spent in the closet, from my current unintentional presentation of myself as ‘straight-acting’. All of which combines to mean that when I see someone’s online dating profile specifically saying that they’re looking for someone ‘masculine’ or advertising that quality in themselves, then to me it is an instant red flag. I hate that attitude, and the fact that it tacitly supports mainstream society’s marginalisation of effeminate men, while promoting a desire to conform to a ‘straight-acting’ standard. I think it is an attitude that is damaging to the community and that does a huge disservice to those amongst us who have been, and still are, the most visible. So for me, as a ‘masculine’ presenting man, in that scenario I would much rather be in the company of my ‘feminine’ presenting compatriots. As a final note for this post, an extension of this rejection of feminine expression is that within the gay community it is very difficult for drag queens to find a boyfriend. I’ve seen a couple of online profiles where men mention that they sometimes perform in drag, and they always raise it as a major issue to be aware of. Again I find this a curious attitude – the drag persona is just for the stage and the performance, so I always find it strange that the man behind the dress has difficulty finding a partner outside of their drag life. I remember last Summer, my then-boyfriend asked me with incredible trepidation what I’d think if he started doing drag in his spare time. He’d done it a few times before (mainly as a theme for his birthday parties), and enjoyed doing it. I was fully supportive, and couldn’t see the problem at all – it would be a hobby that he enjoyed, where he’d make others happy through his performances; why wouldn’t I be supportive? Meanwhile he was stunned at my reaction – having come out in his teens he’d grown up exposed to the attitudes that I described above and was well aware of the stigma that can be attached to drag queens, and he was surprised to receive such a positive response; hence his initial nervousness at approaching the subject! So to finish off the post, my photo will be somewhat different from those of the other bloggers. 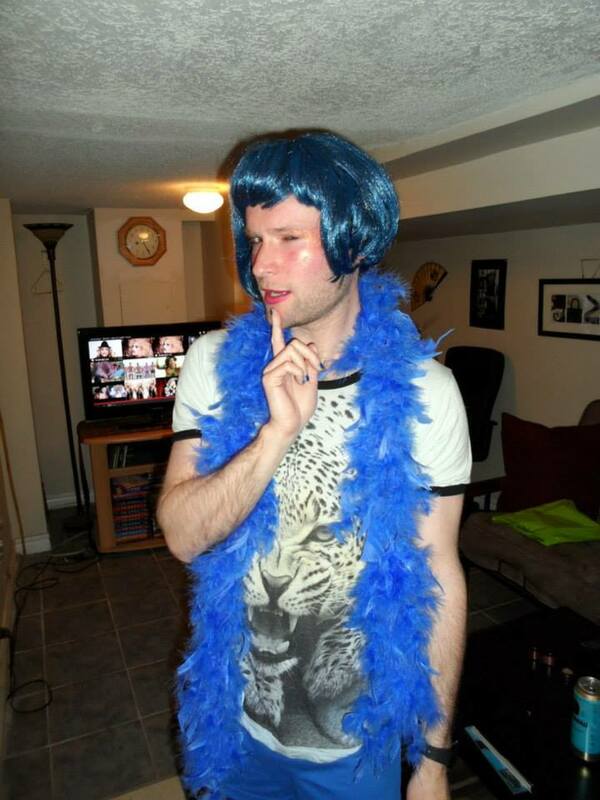 In fact it will be quite the opposite, and instead features me wearing make-up – here’s me in drag at my ex-boyfriend’s birthday party, displaying my own body confidence through very happily embracing not being masculine.